Nifty have launched the Height Rider 21 Electric. Nifty have launched the Height Rider 21 Electric. It is an all-electric version of the Height Rider 21, which has been popular in the Australian market over the last few years. 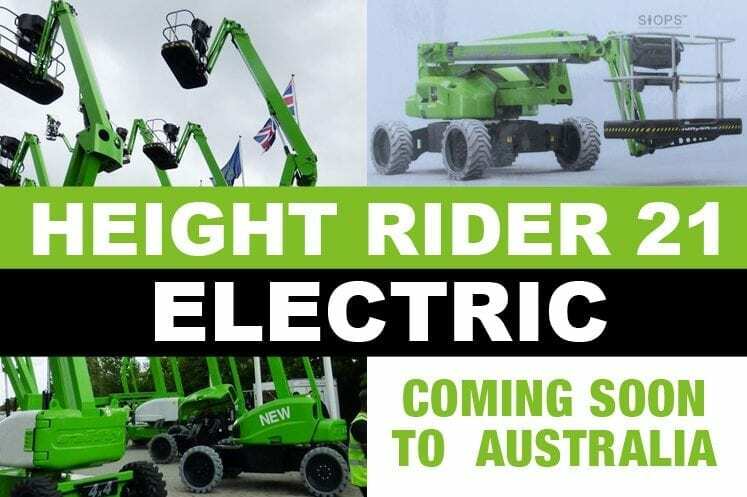 This 21 metre all electric boom will become available to Australian customers in the coming months so keep an eye on our website or speak to our sales team for more information. The team at Nifty Australia believe that the HR21E will be a welcome and useful addition to the range for Australian customers when it becomes available in the coming months. Watch this space! The HR21E was unveiled to the world for the first time at Nifty UK’s recent open day for suppliers and also at the Vertikal Days trade show in UK. John King invited some of Nifty Australia’s customers to the event for them to see it up-close for themselves. The HR21E is a new all-battery electric version of the updated 62ft HR21. It has direct electric drive from a compact electric motor and pump. In the HR21E these replace the hybrid power pack found in the HR21. The HR21E has 13 metres of outreach, a 250kg platform capacity and 150 degree articulating jib. The Height Rider 21 Electric can work at grades of up to 30 per cent and has an overall weight of 6,640kg.